A one-of-a-kind Yellow Submarine Custom Schwinn Stingray Bike is currently up for auction at eBay and it is a pretty sweet ride. 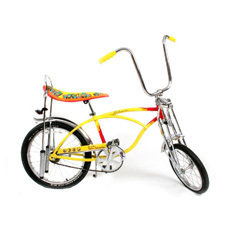 Donated by The Beatles and Apple Corps, this limited edition Schwinn Krate, Sting-ray model Yellow Submarine bicycle was created for promotional use in 1999 and was never sold publicly. The bicycle features the beautiful Yellow Submarine artwork and brings you the unique opportunity to own a rare piece of The Beatles memorabilia. The bike is part of a series of auctions from artists and songwriters from across the EMI family, supporting the Red Cross to raise funds for the people affected by the earthquake and tsunami in Japan. EMI will match all funds raised from these auctions up to a maximum of one million euros, so you can feel good about throwing down your cash. The primary downside is that this is a UK based auction, which pretty much takes if off the table for US potential buyers who lack an unlimited cash flow (raises hand). The current bid as of 4 PM EDT on April 12 is GBP 1,120.00 or approximately US $1,838. Worth it! This auction ends April 21, 2011! I hope the person who wins this bike really loves it! Thanks to the late great Vonda Dix for the Tip! ← Yes It Exists: Iggy Pop Action Figure! Amazing! How on earth did you find this? You come up with the most incredible posts!